Actor and activist Danai Gurira (left); Phumzile Mlambo-Ngcuka, Executive Director of UN Women; and actor and activist Reese Witherspoon (right) take part in the celebration of International Women's Day at the UN Headquarters. Ni una mas in Latin America, Balance ton porc in Europe, Bring back our girls in western Africa, Times Up in North America, #HeForShe and #MeToo in nearly all countries, were just some of the campaigns that have only grown from strength to strength, said Phumzile Mlambo-Ngcuka, the Executive Director of UN-Women, the Organization’s Entity for Gender Equality and the Empowerment of Women. 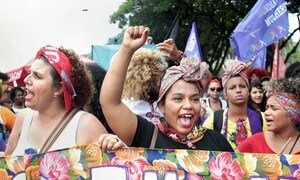 “We celebrate today the power of activism to bring change for all women, their solidarity and the sisterhood of humanity,” added the senior UN official. Alongside Ms. Mlambo-Ngcuka in the UN General Assembly Hall, American actor and producer Reese Witherspoon highlighted that the movement for women’s rights will continue until it achieves its goals. “Understand that we will not leave, that we will not shut up, we want to see us represent 50/50,” said the Oscar-winning actor. American-Zimbabwean actor and playwright Danai Gurira – who in addition to portraying Michonne in the TV series The Walking Dead and ‘Okoye’ in the blockbuster movie Black Panther – is also a noted education and women’s rights activist, testified about her own experience as a woman in her professional career. The potential of girls and women must not be squandered, added Ms. Gurira, thanking those who stand up for women’s rights and urged many more to join in taking the stand. UN Secretary-General António Guterres speaks at the observance of the International Women’s Day 2018. In the same vein, UN Secretary-General António Guterres expressed that the demand an end to abusive behaviour and discriminatory attitudes against women is something that every “sensible” man and boy should want. “Because gender equality is a fundamental human right [and] there is no better path to a more peaceful and prosperous world than the empowerment of women and girls,” he said. “Gender inequality, discrimination and violence against women harm us all,” added the UN chief, noting overwhelming evidence that investing in women is the most effective way to lift communities, companies and countries. In his remarks, Mr. Guterres also highlighted the importance that women’s participation brings to societies and economies. He, however, also said that while much has been achieved since the first commemoration of the International Day (in 1975), challenges remain. “We still need to break the structural barriers that women and girls face – unpaid care work, unequal pay, harmful stereotypes, discrimination and violence,” he stressed, reiterating his call on everyone to demand gender equality and women’s empowerment together. Also speaking today, Miroslav Lajčák, the President of the General Assembly, highlighted that many efforts have been made to ensure women’s empowerment and gender equality but added that much more needed to be done. “For every woman who enjoys her human rights, there are too many others fighting for their own [and] for every woman living in safety, too many others are living in fear,” he said. He expressed that the world needs to reinvigorate the focus on gender and the UN must lead the way. “We can no longer call for gender equality without following our calls with action. We can no longer speak out for women’s rights without speaking out even lounder when they are violated and we can no longer agree that action is needed without taking it ourselves,” added the Assembly President. 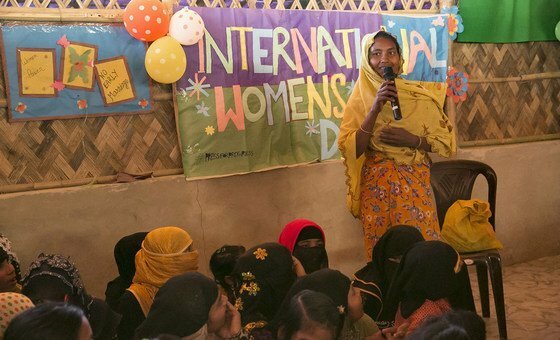 Held under the theme ‘Time is Now,’ International Women’s Day 2018 celebrates the work of rural and urban activists who have transformed the lives of women around the world. 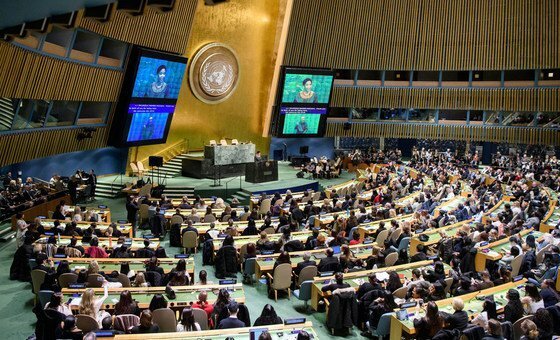 In addition to events at the UN Headquarters in New York, the International Day was also marked in all corners of the globe with a number of events, including forums, marathons, concerts and video screenings. It also comes ahead of the 62nd session of the Commission on the Status of Women, the global policy-making body dedicated exclusively to promoting gender equality and the empowerment of women, which will be held from 12-23 March.